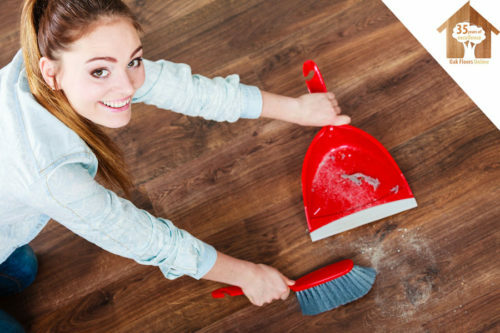 5 Steps to Keeping Your Oak Floors Clean this Autumn! Home/News/5 Steps to Keeping Your Oak Floors Clean this Autumn! Leaves, mud, Halloween… Autumn can be a nightmare season for keeping those oak floors clean. Thankfully we’ve got some simple tips to help you out. If you’ve got kids, you know the challenge of keeping your home tidy. Unfortunately, Autumn can be a very challenging season if you own oak flooring. Not only do you have to deal with the daily trail of fallen leaves and mud caused by constant rain, you can be certain your children will be dragging in extra dirt after they’ve been trick or treating for Halloween, too. There’s no need to worry, though. We’ve come up with 5 simple tips to keep that oak floor in pristine condition. Start by brushing or vacuuming the floor. This will help remove any dirt or grit that may be caught in the porous layers of the oak floor. Add cleaner concentrate into a warm bucket of water, though don’t put too much in as this could damage the floor. Dampen your mop and wring any excess water. You don’t want to use too much water as this could end up seeping through your floors, causing problems later on. Clean the floor with the damp mop with even strokes. Make sure you clean the mop every once in a while to remove dirt and grime. Finish off by drying the floor with a towel or dry cloth, buffing the surface. Once that’s done, you can admire your hard work in all its glory! Always use wooden floor cleaning products if possible. Normal store-bought cleaners have chemicals that may harm your oak floor in the long term. Despite what the infomercials say, never use a steam cleaner on oak floors as the temperature (not to mention water content!) can have a devastating effect on your floor, inflicting long-term irreversible damage. Our team of experts can advise you on the best cleaning solutions for oak floors and more. Speak to a team member today.